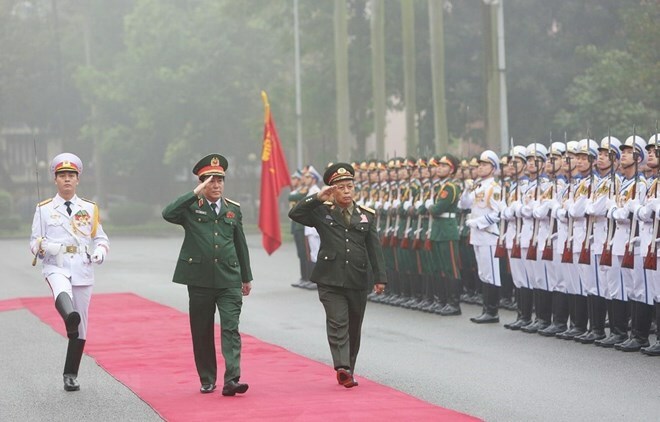 Hanoi (VNA) – Heads of the general departments of politics of the Vietnam People’s Army (VPA) and the Lao People’s Army (LPA) held talks in Hanoi on March 19, sharing the view that cooperation between the two armies has become a pillar in their countries’ relations. The event was part of an official visit to Vietnam from March 18 to 22 by a high-ranking delegation of the LPA led by Lt. Gen. Thongloi Silivong – member of the Lao People’s Revolutionary Party Central Committee, Deputy Minister of Defence, and Chairman of the LPA’s General Department of Politics. At the talks, Gen. Luong Cuong – Secretary of the Communist Party of Vietnam Central Committee, member of the Central Military Commission’s Standing Board, and Chairman of the VPA’s General Department of Politics – said the LPA delegation’s visit that shortly followed an official trip to Laos by Party General Secretary and President of Vietnam Nguyen Phu Trong will help realise high-level agreements of the two countries. It will also contribute to the time-tested friendship, special solidarity and comprehensive cooperation between the two countries’ Parties, States, armies, and people. Reviewing their general departments’ ties, the officers said bilateral cooperation has been carried out in a result-oriented manner, especially experience sharing, personnel training, mutual visits at all levels, cultural exchanges, and repatriation of remains of Vietnam’s volunteer soldiers and experts in Laos. Thongloi Silivong affirmed the importance of the Vietnam-Laos defence cooperation, voicing his belief that the armies’ sound relations will solidify the trust and all-round links between the two countries, thus helping to ensure political security, peace, stability and development in each nation. At the talks, both sides agreed to increase cooperation in training Lao military officers and students at schools and academies of the Vietnamese Ministry of Defence. They will assist each other in communications activities to popularise the traditional friendship, special solidarity and comprehensive cooperation between the two countries.